Navigator of the Seas which is operated by Royal Caribbean has today resumed service after a month-long dry dock to upgrade the ship. The upgrade has been part of a fleet wide revitalization program to bring all the latest new innovations to all cruise ships. The ship now has all the latest innovations which the cruise line is so famous for. From today passengers can take full advantage of all the new features including the well know flowrider. Its set to be a popular attraction onboard and brings the standard of activity in line with the Oasis class vessels. Guests will be able to try out their water surfing skills on the open deck using the flowrider. Other new features which have been added on Navigator of the Seas are new virtual balconies for inside staterooms which is a live video feed. But it’s only been added to 81 staterooms. This new feature will also be on Royal Caribbeans upcoming ship Quantum of the Seas. There is a new Mexican dining venue called Sabor along with plenty of new dining options all over the ship. 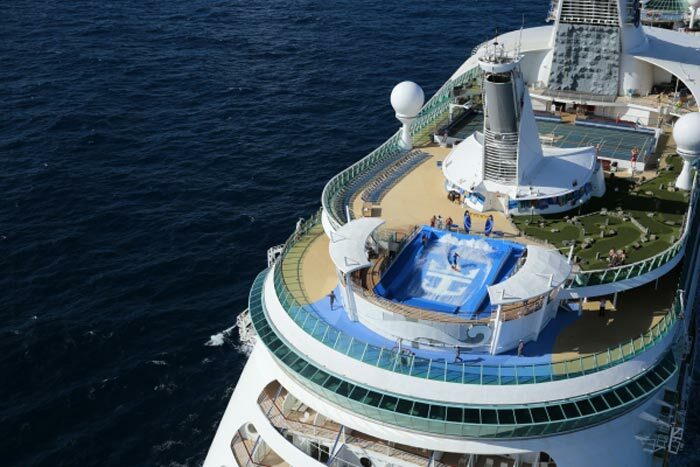 Navigator of the Seas will now be sailing from its home port in Galveston, Texas from today. The ship will be doing 7 night cruises around the Western Caribbean including stops at Cozumel, Mexico; Roatan, Honduras; Belize City, Belize; Falmouth, Jamaica; and George Town, Grand Cayman. Let us know what you think of the new upgrades and if you’ll be booking a cruise on the ship in the future. You may post in the comments below.